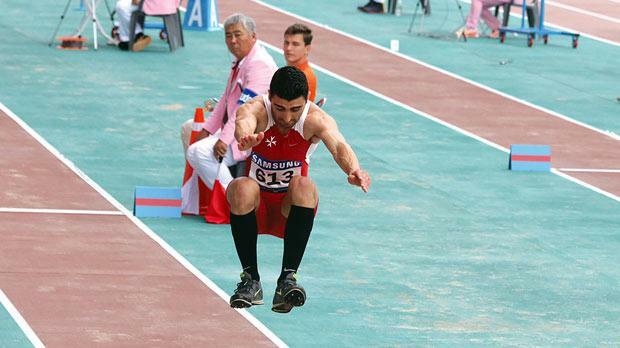 Aiming high... Long and triple jumper Ian Paul Grech is willing to make a name for himself and Malta. Talking to athletes about their preparation, most of the focus tends to be on the physical effort. There is more to it, however, and anyone trying to reach the higher levels of any sport needs more than physical strength. So says Ian Paul Grech, currently the leading Maltese male long and triple jumper. “Most of the times, before a jump I close my eyes and visualise the whole approach of the jump, so I try and remember the technique,” he added. “Mental preparation differs between competitions held in Malta and those overseas. “In Malta, I am more relaxed for different reasons. “One of the reasons is that I am sure that my coach, Jivko Jetchev, is present to help me. “Jumping events such as long jump and triple jump are technical events and the coach plays a key role during the event. “Unfortunately, when I go abroad, my coach is not always present, so my mental preparation is even more challenging. This mental preparation is crucial for athletes who take part in the events Grech specialises in, where they have to put in a number of attempts and often quickly have to forget a bad jump. “In jumping events, most of the things have to be perfect,” he explained. “Usually the run-up approach for a competition is between 20 and 22 steps, and all these 22 steps have to be the same every time. “If one of the steps is shorter than the usual run-up, then take-off will be far away from the take-off board and vice-versa. “It is very easy to put in a bad jump especially if the weather conditions are not the best. “That is why it is very important for my coach to be present because he is the one who tells me what to do and what I need to improve. That strategy seems to have worked fine, particularly of late. “Last year was one of the best seasons I ever had in my athletics career,” he confirms. “I started off the season with an indoor competition in Manchester. “I won the long jump senior men category with a jump of 6.72m. He was soon back in groove, however. “On the first day of the National Championships I competed in triple jump and broke my own championship record, which I had set the previous year with a jump of 14.33m,” Grech reflected. “In June I was selected to represent Malta at the first European Games held in Baku, Azerbaijan. “This turned out to be the best experience so far in my athletics career. “I competed against strong athletes and was really motivated. “I achieved a personal best of 7.13m, placing fifth out of 15 in long jump. This was one of the best moments in my life because, although I have participated in many other competitions abroad, I had never done so before such a big crowd. This lines Grech up nicely for the future. “I’ve already started training in preparation for the indoor season,” Grech said. “The first international competition for the year will be the London Indoor Games and then I will try to qualify for the World Indoor Games being held in Portland, USA. “Obviously, every athlete’s aim is to try and qualify for the Olympics and like everyone else that is my biggest dream… to represent Malta in the Olympics. “My main target is to start preparing both physically and mentally for the following year when I will have three big competitions: the GSSE, World University Games in China Taipei and also European Team Championships.